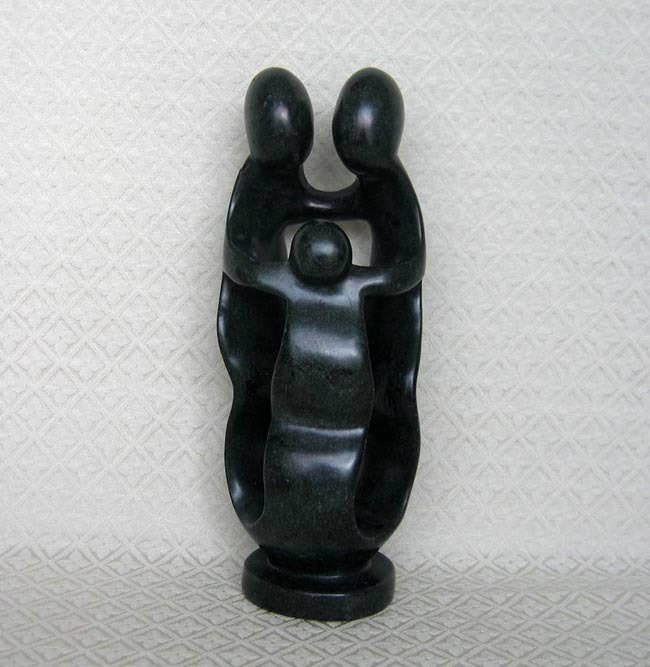 This “Family of Three” Shona Statue is a joyful tribute to familial relationships. Joseph, Mary, and Jesus link arms in an unbreakable yet flexible dance of love. This carving measures 12 inches tall. The Shona tribes of Zimbabwe, literally translated as “the house of stone,” are considered by many to be among the world’s finest sculptors. Modern Shona artisans select and quarry their own stones, just as they did thousands of years ago. Statues are hand-carved using simple chisels, polished with sand and beeswax, and heated on a fire to bring out their brilliant colors. A central belief and practice in traditional Shona culture is ukama, which means living together in close family relationships. Family ties are all-important to these people, and from birth through death and beyond, Shona families are bound together in the mutual respect, support, and love that is the greater extended family. In the family support system of the Shona people of Zimbabwe, a life-long process of acculturation ensures that children will grow to respect and honor their elders and ancestors, live humbly, and preserve the traditions that have ensured the survival of their people for more than a thousand years. The Shona society has a strict hierarchy, which has no room for arrogance, pride, or greed because each member is important to the survival of the community. The old must respect and nurture the children because they are the future; while the children must willingly respect the elders because their experience and wisdom will protect and sustain the societal values and family fabric.